Le Flâneur Guesthouse, Lyon, Francja : Rezerwuj teraz! 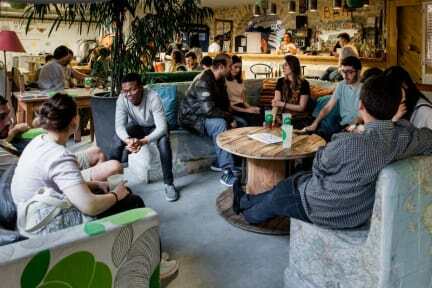 Revive the real hostel experience in Lyon ! Cosy atmosphere, best staff in Lyon, cool prices at the bar and real exchange experience ! 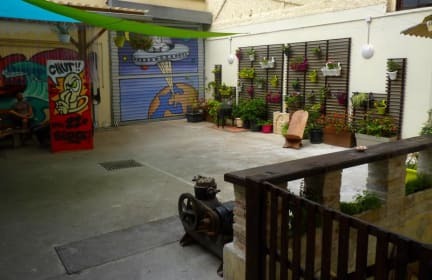 Le Flâneur Guesthouse, first property to operate as Scop (co-operative), is proud to join the players in the social economy, of which the neighborhood is a great ambassador, with a way to look at the economy and life in a different manner. Hanging around is a real lifestyle, ready for the trip? Le Flâneur Guesthouse offers a real low price alternative for your nights in the heart of a neighborhood that has kept its soul, just 15 minutes from main tourist attractions, 10 minutes to the Rhone banks and only 2 metro stops Perrache and Part-Dieu train and bus stations! Le Flâneur Guesthouse offers 11 rooms. Discover our great space dedicated to our strollers to share authentic life experiences (a common area of 160m2 does offer many possibilities! ).